For those Portlandia lovers: Oh your sweater is sad? Put a bird on it! 1. Le Tote is awesome and if you haven't tried this online closet where you rent clothes for a fixed amount per month, you need to give it a go! 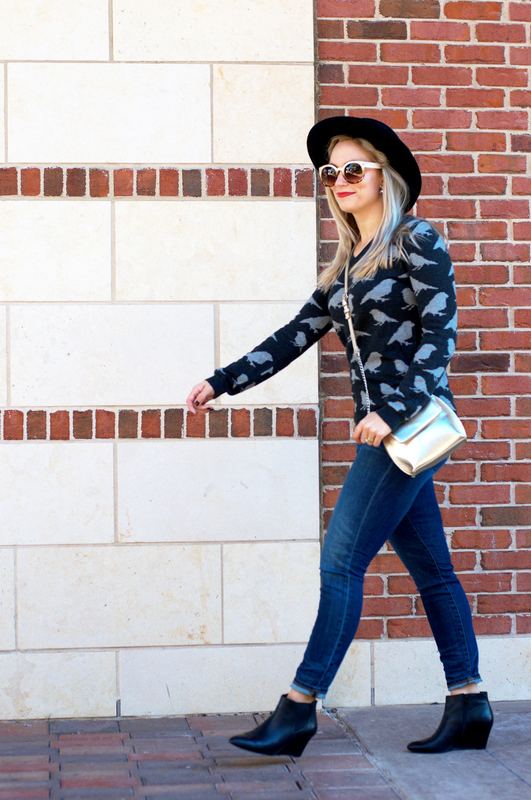 This Bird sweater and perfect little gold clutch is courtesy of Le Tote. Seriously guys - one price, wear the clothes for however long you like, keep items if and only if you really want them, otherwise just return clothes for MORE CLOTHES! Boom! And HERE is $25 off your first tote! 2. Madewell is having a 40% off sale items sale! That's huge! And Madewell denim is my fav! This particular pair of denim is not on sale, but they have a bunch of great stuff that IS on sale! Still loving these Free People Sunnies and I could walk for days in these Nine West wedges! Hope everyone has a happy Tuesday! xoxo! Let's Talk Black Friday Deals! Peace on Earth, Let it Begin With Me!